All you need to sign up is a valid Rite Aid prescription. With Prescription Notifications, you can get reminders and refills with just a text. Stop stressing about your prescriptions: let us refill them automatically before they run out. We know just how chaotic your life can get. Looking for a way to shorten your “to do” list? Refill your prescriptions at Rite Aid and sign up for our Automated Courtesy Refill Program. Qualifying prescriptions will be automatically refilled a few days before they run out. And we’ll even send you a notification that your medication is ready to be picked up. When your last prescribed refill is coming up, we can also work with your physician to help get it renewed. Enrollment in the Automated Courtesy Refill Program is free and easy and most prescriptions qualify. * Talk to your pharmacist for more information and to sign up for the program in-store today. You can also sign up for this service online through your My Pharmacy account. Don’t have a My Pharmacy account yet? 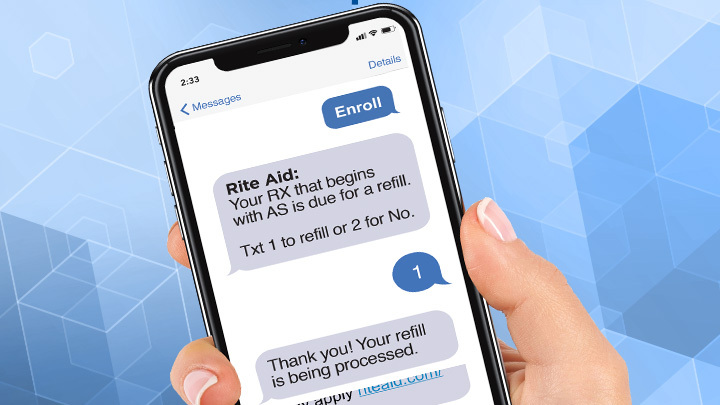 We’ve made it easy to transfer your prescriptions to any Rite Aid Pharmacy from the convenience of your phone. Get your prescriptions at the same time with OneTripRefills. Coordinate a refill schedule so your prescriptions can be picked up on the same date each month. Talk to a pharmacist to sign up for the free program. Pick a date to get your medications each month. Answer our monthly call – one week before your pick up date you will get an automated call authorizing us to fill your prescriptions. Go to your local Rite Aid to pick up the prescriptions. Talk to your pharmacist to get started. High-Quality Healthcare Right Where You Shop. RediClinic delivers high-quality, convenient and affordable healthcare that fits your lifestyle—now at your neighborhood Rite Aid. RediClinic board-certified clinicians collaborate with local physicians to treat common medical conditions and provide preventive care on a walk-in basis, seven days a week, at clinics located inside select Rite Aid stores. RediClinic staff treats more than 30 conditions such as: strep throat, ear infections, urinary tract infections, pink eye, and skin rashes. RediClinic also provides health screenings, medical tests, immunizations, and physical exams...all to keep our patients living healthy. 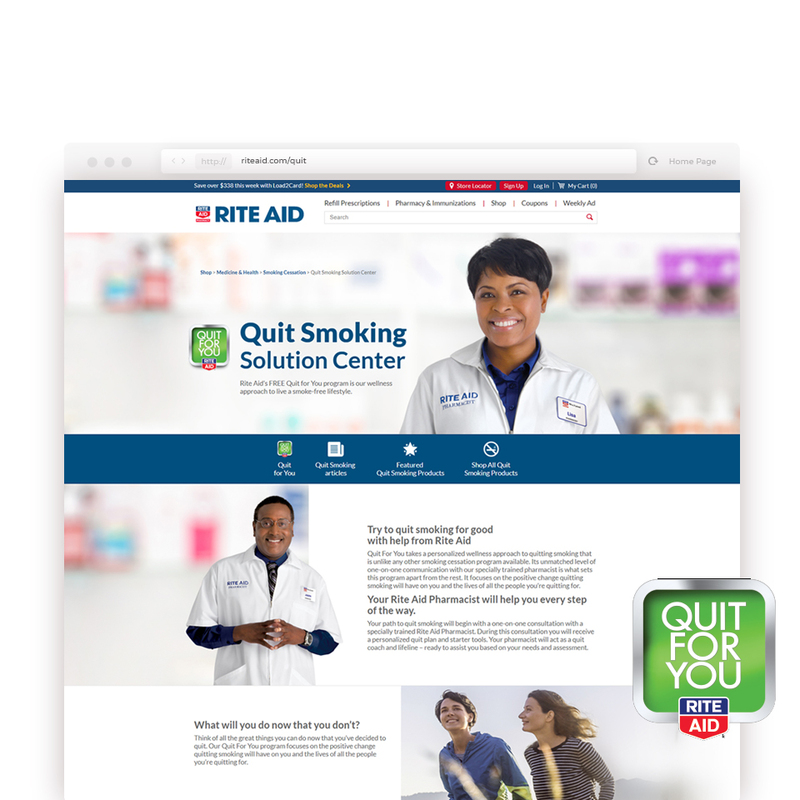 Rite Aid’s FREE Quit for You program is our wellness approach to live a smoke-free lifestyle. With our interpretation service, your pharmacist can assist you in more than 170 languages. We also offer prescription label information in 12 languages for your added safety and convenience. Taking your medications as prescribed—without missing doses—is an important part of reaching your treatment goals. If you take certain prescriptions regularly, ask your Rite Aid pharmacist about your Rx score. This score tracks how well you're taking your prescriptions. The goal is to achieve an Rx score of 100%. Your pharmacist is here to talk with you about your medications, answer any questions, and give advice about taking prescriptions safely, so you can avoid side effects and dangerous interactions. We offer label information in a large font format so it’s easier and safe for you to better understand your medication instructions. An RFID chip containing recorded prescription information is attached to the bottom of the prescription bottle. The recording is read aloud when the prescription container and RFID chip are placed over a special speaker device. The speaker device will be shipped to the patient’s home at no cost to the patient. See your pharmacist for details. 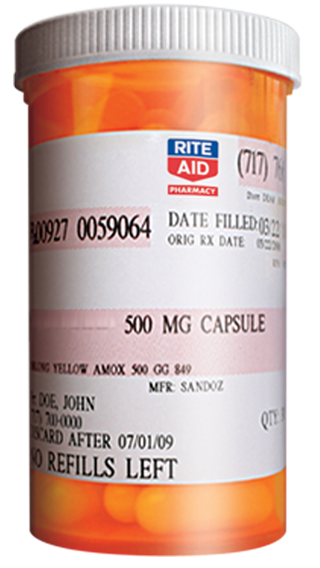 Braille label strips can be placed onto prescription bottles over the top of the actual prescription label. See your pharmacist for details. Rite Aids, for easy access to vital sign readings, including blood pressure, height, and weight. We perform a comprehensive drug utilization review to watch out for dangerous interactions. And if you need a refill out of town, all of our locations are connected. Your Rite Aid pharmacist can customize your child's medication to suit his or her flavor preference. * Prescriptions are ineligible for the Rite Aid Automated Courtesy Refill Program if 1) purchased through mail-order; 2) fail to meet permissible refill parameters; 3) are government funded prescriptions where prohibited by state law and; or 4) are a controlled or regulated medication that requires a new prescription for every fill. Additional limitations may apply depending on state law.